The Cake itself is incredibly dense and moist, full of Carrot, Pineapple, and Craisins. 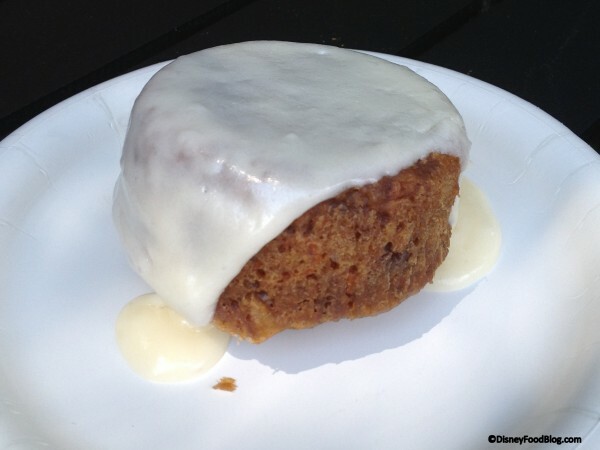 It’s served very warm, with a topping of decadent Cream Cheese Icing that’s ladled over it — also warm. 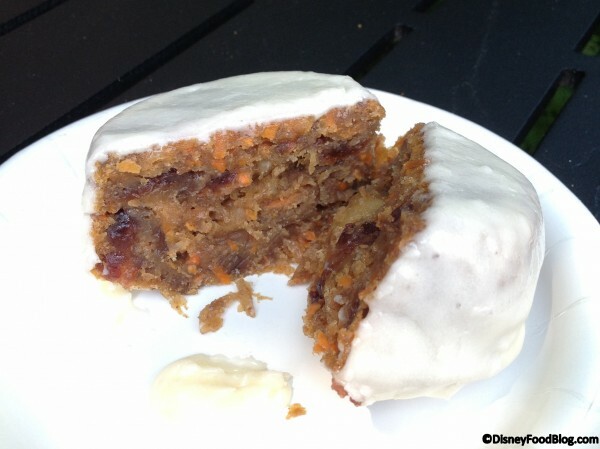 Just when I didn’t think I could love Carrot Cake more than I already do — they pull this trick out of their hat! The pictures just don’t do it justice. The new area that’s devoted to Puerto Rico is very cool. But even more, the food here is great across the board! 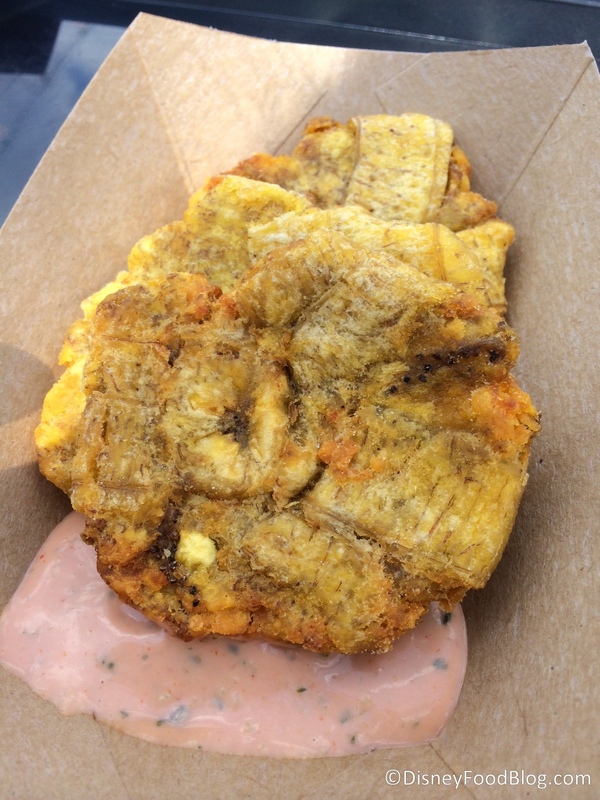 While we enjoyed all of the dishes, the simple Tostones, or Fried Green Plantains with Mayo Ketchup, was one of my favorites. This is a great example of simple, traditional food being done well. And Mayo Ketchup — why hasn’t anyone told me about this stuff before?! While the tostones were good on their own, the dipping sauce brought them to “I’d definitely buy them again and again” status. So, you guys aren’t new here. One thing you know about me: I am not much of a seafood lover. Unless you serve that seafood with Bacon and a Spinach Cheddar Gratin. And then I’m all in. 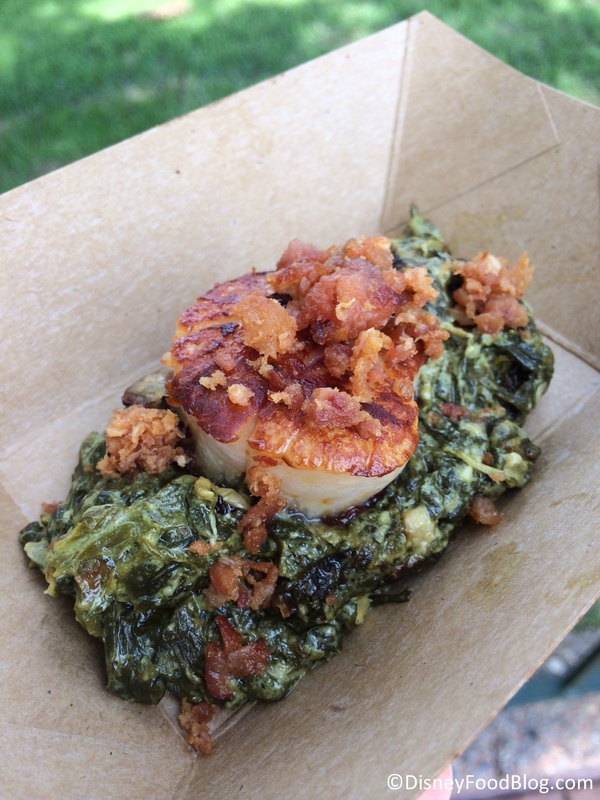 I wasn’t super excited about the Sea Scallop with Spinach Cheddar Gratin and Crispy Bacon, one of the Scotland Booth’s three new dishes. But my first bite made me a believer (and then, of course, I had to take a few more bites just to be sure). The seared scallop was fine, but the real key to this dish is that crispy bacon on top and the give-me-the-recipe-please spinach gratin. Holy wow. 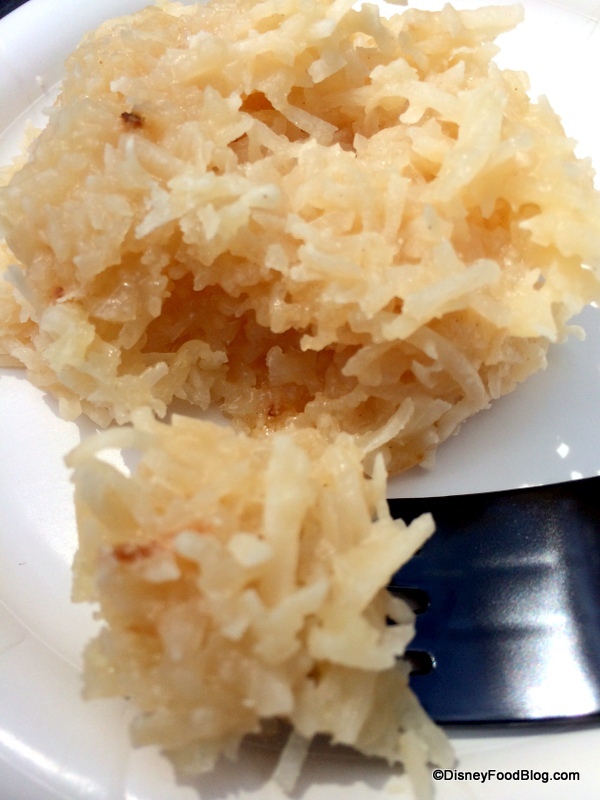 The Brazil Booth offers some awesome options this year, but one we’d really been looking forward to was the Cocadas — or Brazilian Coconut Candy. Having never tried it (or even seen it) I wasn’t quite sure what to expect. But the dense richness of the treat made up for the boring appearance. Remember haystacks from when you were a kid? The super-sweet coconut candy mountains that are AWESOME? Yeah — it’s like that that. Only 100 times better. And it’s HUGE! It makes sharing totally plausible. I gotta tell you…I was a little concerned when I heard that the France Marketplace was changing up one of its signature dishes. This year, Escargots are featured in a tart, rather than in little mini-brioche. 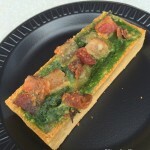 But fans of the previous iteration have nothing to fear, because the new Tartelette aux Escargots — or Escargot Tart with Garlic, Spinach, Bacon and Parmesan — is pretty fantastic. 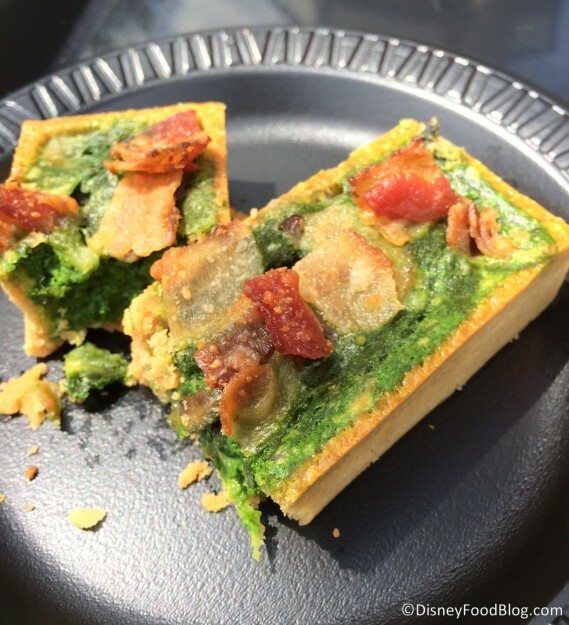 A neutral tart crust is filled with parmesan-spiked spinach and snails, then topped with BACON (are we seeing a theme here?). A fun twist on an old classic. 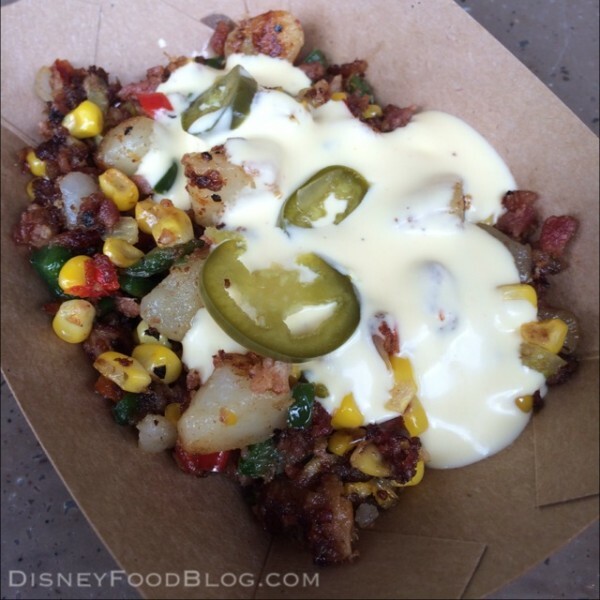 The Mexico Marketplace rarely disappoints, and this year they’ve re-vamped a guest favorite to make it even better. The Fried shrimp, pickled habanero pepper, and onions on a flour tortilla is simple, but delicious. What really made this a winner was the light-as-air breading on the shrimp and the absolute freshness of the whole dish. 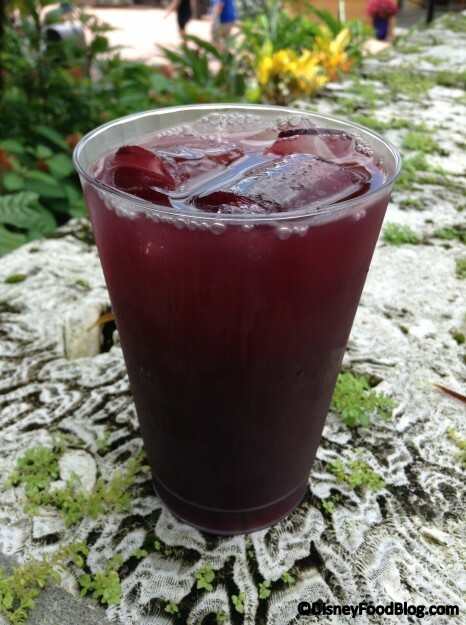 Paired with the generously-sized Sangria at the booth it makes a great snack to be sure. We weren’t prepared to like the Sauerkraut Pierogi with Pork Goulash at the Poland Marketplace nearly as much as we did, but it’s like a sleeper hit! The Pierogis get an interesting twist from what we’re used to seeing — a filling of potato. Here, they’re stuffed with a mild Sauerkraut instead. 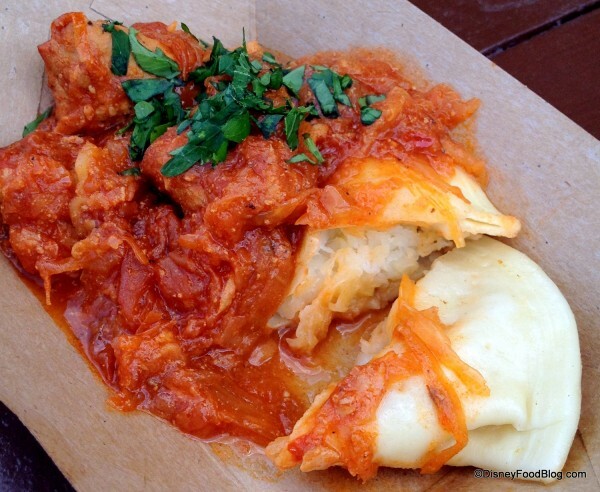 The dumpling is then covered with a thick, rich Goulash, full of tender chunks of stewed Pork. 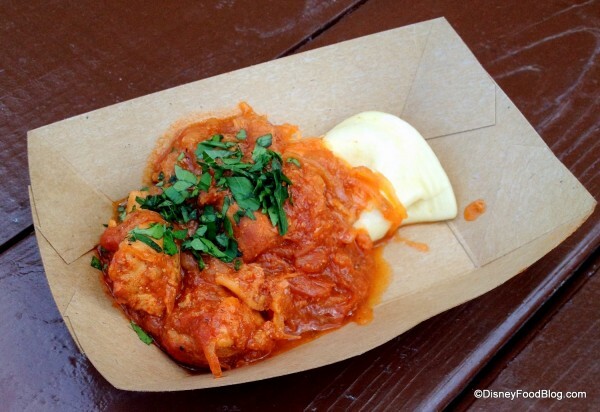 The contrast of flavors makes this comfort food dish a great addition to the Festival lineup. After thinking that last year’s Food and Wine Festival offerings were seriously lacking, I was bowled over by the size, freshness, and flavor of this year’s new dishes. When I was done touring the booths yesterday, I had — no joke — 17 new favorites that I wanted to recommend to you! 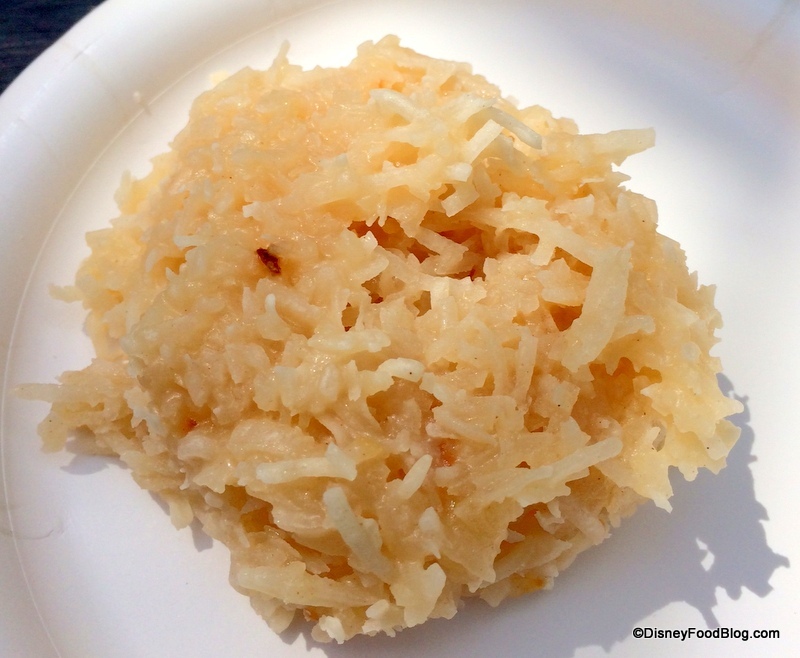 And don’t forget about all of the OLD favorites that are back this year — Mushroom Filet in Canada, Griddled Cheese in Greece, Dole Whip at the Refreshment Port, and more. The bottom line? You must — MUST — plan for at least a few days at the festival this year to eat everything that’s truly worth eating. 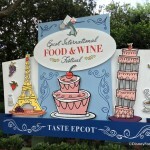 This is probably my favorite collection of dishes ever at a Food and Wine Festival. To see the full list — and pictures of EVERYTHING — be sure to click over to our Marketplace Booth page, and then on the links to take you to each booth’s individual page. You can view pictures of every single dish! What’s dish are you excited to try at the 2014 Epcot Food and Wine Festival? Leave a comment and tell us your favorite! AJ, is there any way you could post a picture of a map that shows the location of the booths? We’ve never been before and are trying to get an idea about where all the booths are located so we can incorporate them into our touring plans. Thanks! You post the best info. 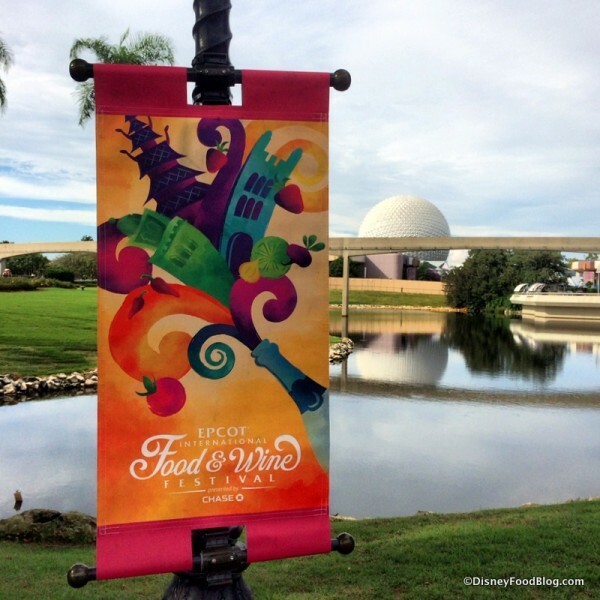 We haven’t been to the Food and Wine Fest for a few years and boy have things changed. Thanks to you I can make a list of “must haves” and fill in with “sounds goods”. 19 days and counting. My husband is disappointed that the new escargot dish contains several things he is not permitted on his restrictive kidney diet (oddly, snails are okay). He was really looking forward to having some of those gross little things tucked into brioche. 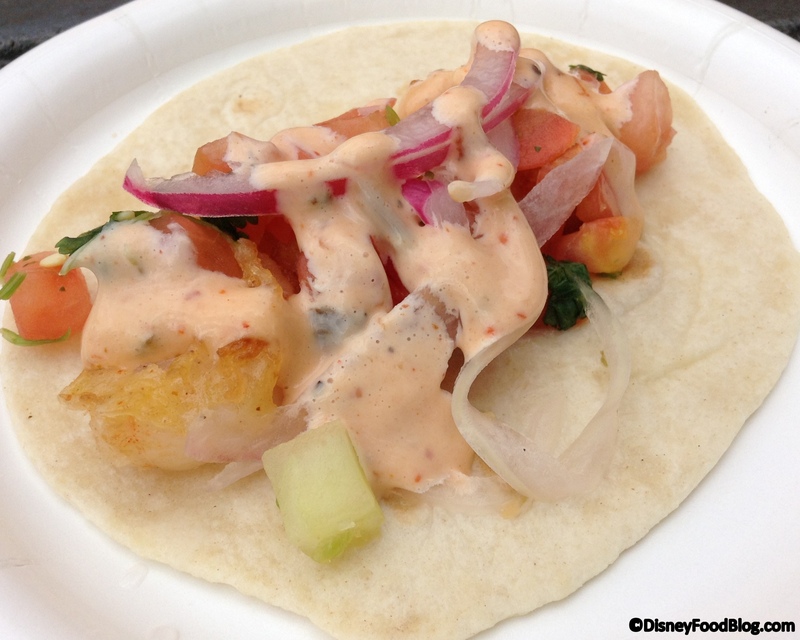 But the shrimp taco looks like a winner and with pictures and descriptions of the various dishes from TDFB, we have laid out some good possibilities for our first time at F&W. Sounds like fun (and a lot of work)! Have a great time! We went yesterday for the “soft opening” The lamb with the mint pesto in Australia was our favorite! Great post AJ! Thanks for taking the time during such a busy time to let us know your top picks. Would never have guessed that the “Hash” would be your top pick! In coming days, please do list the rest of your top picks (you mentioned 17 new ones — so you have eight or nine more?) — as well as any “must have” beverages. Thanks again for the great job you do on the DFB. Question: Would you be able to find out if the Chase Lounge (at American Adventure) will hand out wristbands this year to Chase Disney credit card holders for access to a Chase reserved area at the nightly concerts and/or Illuminations? They apparently did this the last couple of years on a first come first serve basis in the morning, and only on certain days (Sat, Sun, Mon ?) Thanks! Hannah — We are so glad you find the info helpful! Sandra — That’s too bad. I know that a lot of folks really loved the old dish. Maybe you can try an ADR at Les Chefs de France? They still have Escargot on the menu there. It’s not in brioche cups, but it’s topped with buttery bread rounds. JimO — I’m sure those other favorites will come out somewhere. 😉 Regarding the Chase Lounge question, we can get clarification on that for you this weekend. 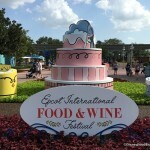 We spent the day at the F&W today and agree with you reviews on the food items. I will say I’m extremely disappointed in the size of the beverage containers this year at the marketplaces. The beer and wine are being served in the flight sized cups that are quite small. This was not the case in years prior. The kimchi dog was no bigger than a bite. We don’t mind spending a premium price for the items at the F&W, but shame on Disney for skimping on the sizes. Great information thank you for sharing. Typically what is the price range for food and wine? Is it better to purchase a gift card and load money onto it? I believe I read somewhere you could do that. Thank you. Tuesday will be our first day. Going ten times this year. That French tart looks tasty. Hi! I just love your blog. It seems to have some of the best info, especially on the F&W Fest. We were there this weekend as well, and also loved the bacon hash and the escargots tartlette. The escargots dish was especially surprising to me. I was disappointed to hear that they had changed it and was skeptical to try the new one, but boy was it great! My only gripe about F&W is that they don’t provide enough of the recipes in a timely fashion. Now that I’m home I’m ready to try some! Do you happen to have any info on that? Thanks again for a great job! 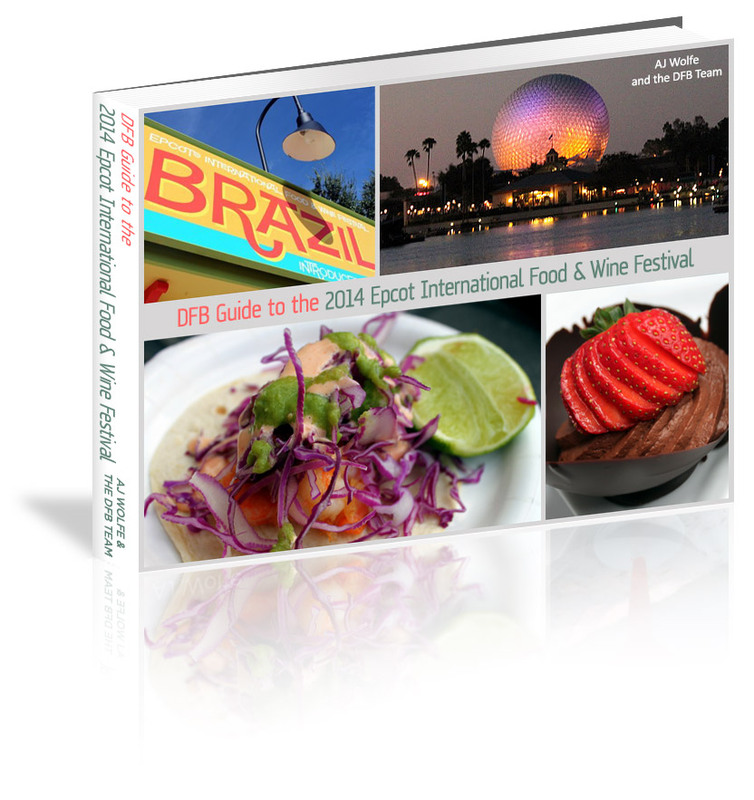 Karen — You can get Food and Wine Recipes in the food and wine cookbook for sale at the festival. We’ve done a few of the recipes here on DFB from past years, though! Outstanding culinary demos at 1 and 3. Hate to bug you AJ, but I was wondering if you had a chance yet to find out about the Chase Lounge, and whether they are handing out wristbands this year for reserved spots at the nightly concerts and Illuminations, and if so, whether it’s only on certain days? JimO — One of our team members was in there on Saturday checking out. I’ll check in with her to see what she found out! JimO — We did ask the Chase representatives about this specifically. Yes, they will be offered, and they will be for designated seating at the Eat to the Beat concerts and viewing of Illuminations. They couldn’t give us further specific information regarding which days they’d be available. They did say that they’d be distributed on a first-come, first-served basis. They emphasized that guests should check in at the lounge for more information on the wristbands. Hope this helps! Thanks very much AJ — I really appreciate you taking the time to find out about that! Just came home. The tostones are very good. The best thing I had was the warm chocolate pudding and the iced Irish coffee from the Ireland kiosk. OMG so decadent and delicious. We returned from WDW on 9/26 and actually spent two days in Epcot. Did not buy a thing that I didn’t like but some of my favorites were: Brazil-Pork Belly with Black Beans & Cilantro, Cheese Bread and the Coconut Candy. Japan-Spicy Hand Roll and Peach Sake Gell. Germany-Snickernoodle (or something like that). France’s Escargot was good but I favor the traditional garlic/butter sauce however the Filet Mignon was incredible. Hawaii’s Kalua Pork Sliders were great. Farm Fresh’s Yard Bird was excellant. China’s Bejing Duck and the Black Pepper Shrimp were both great. Mexico’s Shrimp Taco was good but can’t quite make it to my favorite list (and I love Mexican Food). Patagonia’s Beef Empenada, good. I’ve forgotten most of the drinks and wines I had but the Sake stood out and a Lemon Margarita were both excellant. Plus they still have all their regular restaurants and booths. Over all of the above is the Via Napoli’s Four Cheese Pizza. We went there twice during our week. Didn’t make it to Poland’s booth for Pierogi, or Scotland’s Seared Sea Scallop. If I lived a little closer than Nevada, I’d definitely plan to go back. I am desperately searching for a recipe for the Shrimp Tacos…my husband insisted we get them even though we have more than enough Mexican choices at home and he instantly fell in love. I just wish I could go back and try them one more time to know where to start with the sauce. Any chance there will be a link to recipes?? 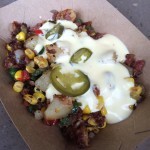 Ok, I love the EF&W Festival, but here are my complaints: the Bacon Hash from the Farm Fresh kiosk was WAY too salty, and trust me when I say it’s rare that I find anything too salty. 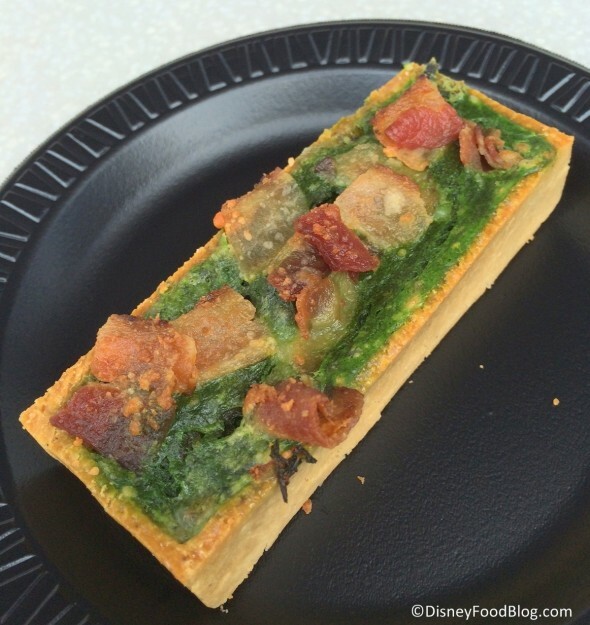 The escargot tart from France was not as good as the escargot in the broiche from previous years. China’s potstickers are fabulous but for $4 getting only two small ones was very disappointing. Canada’s filet mignon was overdone yet again, making it tough and chewy. The best items I’ve found are Hawaii’s Kalua pork sliders, Belgium’s waffle with berry compote, Patagonia’s beef empanada, Mexico’s shrimp taco, Italy’s cheese ravioli, Hops and Barley’s lobster alfredo (save two snack credits for this one! 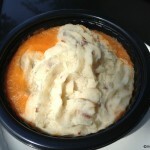 ), and Canada’s cheddar cheese soup. Hi! Can you tell me if the food prepared for the F&W is prepared by one of the restaurants in that country, or it is an outside chef? We had the cheese ravioli & it was fantastic! Trying to decide where to go for dinner if it was prepared at one of the restaurants inside Italy! Thanks! For those of you who are vegetarian, the veggie moussaka at Greece was delicious and so was the veggie fake-crab cake at Terra. Unfortunately the veggie haggis at Scotland this year was tiny and tasteless, after being a standout last year; and my favorite from 2013, the spring rolls with spicy sauce at China, are gone. Shrimp Taco 😀 😀 that was awesome. Really enjoy the Korean lettuce wraps,the black beans and pork bellies.I miss the lobster roll at the American pavilion and Greek salad.All in all fest is great and yes the farm fresh booth has really good but overly salty food.Great chocolate display at the festival hall. Finally getting to the festival this weekend, and my list of must try dishes just got a little longer… Can’t wait! Anyone know how I can find the recipe for the Mongolian Beef Bun from China? It’s sooooo yummy!! I am trying to find out what that little bowl of fruit was at the Ireland stand, It came with the cheese boat/basket, very very nice with the cheese.